The Nikon ProStaff P3 Target EFR 3-9x40AO riflescope is designed for both air rifles and .22 LR rimfire cartridges. 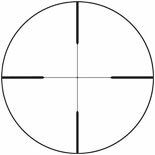 The P3 Target EFR uses Nikon’s Precision (duplex style) reticle with fine crosshairs. To ensure a crisp focus at close range, the riflescope features an adjustable objective lens for parallax adjustments. Its versatile 3-9x magnification ensures that even your extended shots with rimfire cartridges remain accurate and repeatable.